Ten years ago, the world was introduced to the dastardly duo named Madvillain. On one half there’s Daniel Dumile aka MF DOOM, the quirky and wordy MC known for run-on rampant lines, alter-egos up the wazoo and alternative projects that stand still in time (Operation: Doomsday, Black Bastards and The Mouse and the Mask, just to name a few). On the other half you have Otis Jackson Jr., aka Madlib, the prototypical music man of all hip-hop production not named Dilla, who lays low but supplies the culture with the kind of expansive prowess that hip-hop desperately needs. Together, they form one of hip-hop’s all-time finest–a group that set stones, altered mindsets, banged hard and made us all truly realize how exceptional a collaboration can be when made the right way. Madvillainy is their only full-length project to date–although word is that Madvillainy 2 is ready when “DOOM is ready”–and if it stands as their only full-length, it’ll be the greatest record that not only represents Madvillain, but both MF DOOM and Madlib as well. So much of what makes Madvillainy work is simply its approach. There’s no doubt that it’s one of the most unique approaches to hip-hop music, but how so is even more impressive: abstract and experimental lyricism, short tracks, songs constructed mostly on verses alone, its dark villainous theme, the weed-soaked feel and Madlib. Behind all the production, Madlib takes his past experience (Lootpack, Quasimoto, Jaylib, Shades of Blue) and weaves a full-length concept with Madvillainy. The production is lush, dusty and diverse, while at the same time linking arms from song-to-song, making a cognitive record that follows an illustrious theme. 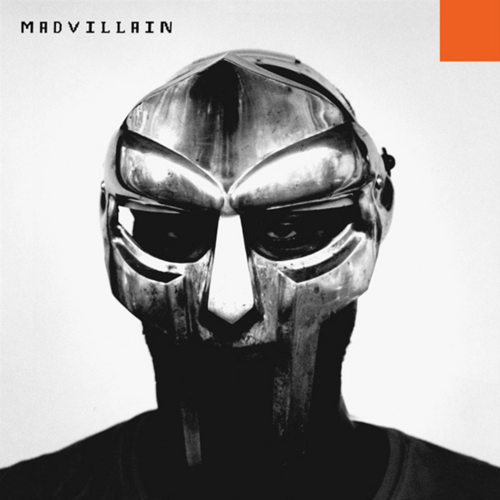 Bouncing from ear-to-ear are movie and comic-like sampling that fittingly blend with rumbling bass takes and colorful jazz cuts, and in some weird mix of sorts, this all creates a running swell of sound that’s parallel with the villain-like theme of Madvillainy. “Curls” snaps and sizzles like a montage behind a diamond heist, with an uppity sound that also features harrowing organs and mafia-like sounding guitar sampling; “Supervillain Theme,” an all instrumental cut, is springy, as if it’s chasing you through an alley, with clinky pianos, a menacing bass riff that hangs in the air and bass drum roars that reinforce evilness; and “All Caps,” which follows, plays beautifully with flutes, synth drops, cutting horn breaks and a melody that once again gives you the urgency of a chase, as if everything in the background is gunning from you. The beauty of Madlib’s production is that we know exactly what kind of music he likes (classic jazz cuts, Brazilian music of all sorts, African percussion, soul and b-movie sampling), and yet he surprises us everytime. Madlib, in every sense of the word, truly is a loop digga (let’s also take the time to acknowledge the fact that the Liberator has around 4-tons of vinyl). Behind the mic is MF DOOM, one of the most mysterious and treasured MCs in hip-hop. Like most of his work, DOOM takes on Madvillainy with his supervillain egos and unique lyricism. If you look at Madvillainy from strictly a critical standpoint, what can you possibly fault the record for? It stands now and forever, as a hip-hop record that hit so many points, influenced further experimental projects, changed the way musicians can tackle an album and mixed two of the most prolific figures in hip-hop history. With Madlib’s production and DOOM’s exotic flow, the best of two different worlds comes together, and yet, Madvillainy feels like a record that was meant to be. That folks, is something. The underground classic from Stones Throw Records, Madvillainy, turned ten years old this week, putting the passing of time into perspective. From 2004, the joint project from Madlib and MF Doom is legendary because it contains some of the best each artist has to offer. This is Madlib at a creative climax as he chops, spins, loops and cuts samples from old movies, Frank Zappa, Bill Evans, Miles Davis, the Street Fighter video game series, Redman and George Clinton. The thing about Madlib is that he has a method that is all his own. Depending on the record, it may come off as sounding different but it is still the Mad Liberator. This is because he is able to construct beats in ways that nobody else can and it comes from the way he uses his samples. Beginning with “The Illest Villains” to the last track, “Rhinestone Cowboy,” it feels as though you’re navigating a cold web of throwback B-horror movies as dialogue and old dusty themes from films such as Frankenstein, The Wild One and The Raven haunt every moment of the record. Madvillainy transitions from track to track at a rapid pace, hardly leaving any time to take a breath and appreciate what it is happening. This is not a bad thing, it just means that the amount of ground Madlib covers is unimaginable. On the journey to the end of Madvillainy there is no solace to be found, especially when MF Doom is afoot. There is no doubt that as an MC, MF Doom is most certainly a villain and he most certainly embraces this role. I mean, the guy wears a mask for crying out loud. Because of this we get to hear from a talented storyteller that is well aware of issues within society, the rap game and how to call himself the best. Doom’s raw rhymes and delivery will keep you coming back, wanting more, time and time again. Ten years ago Madvillainy was released and hit hard with quick tracks and even quicker lyricism. Even today, this album from Stones Throw still packs quite the punch. There is the brilliance of Madlib and his ability to meld melodies and sounds from multiple decades and contexts into a cohesive, musical masterpiece that is dark, funky and filled with hazy marijuana smoke. Then MF Doom arrives on the set, using his words to paint pictures and take the audience further into the dark world of villains and anti-heroes. Madvillainy is proof of how good it feels to be bad.